Beautiful ladies participated in this contest, and I had the pleasure of chatting with a few. I stand by my sentiment that we ought to have arrived earlier so to have more time to visit with all the interesting and lovely people who come out for these events. 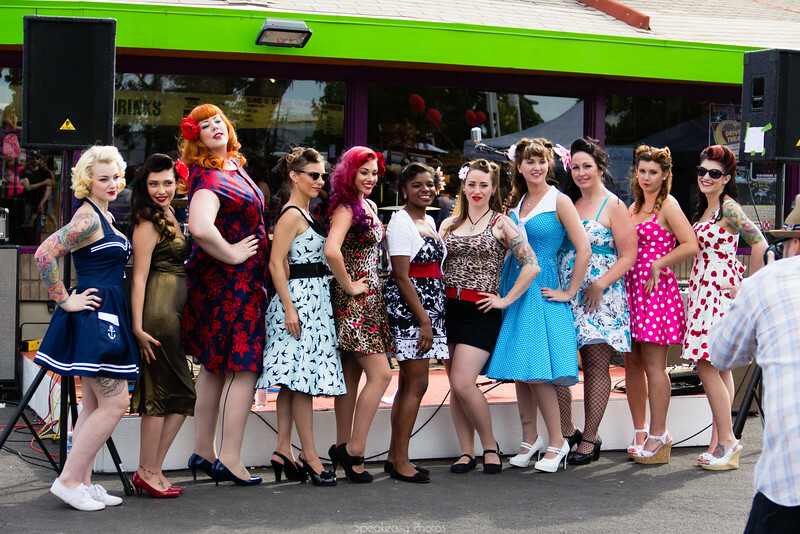 The gal third from the right is an embroiderer by trade and happened to be delivering some goods at the Sweetheart Jamboree back in February and saw me win that pinup contest! She told me that she thought, “I can do that!” And she did compete! Andre, the gal fourth from the right in the teal with white polka dot and white collar dress, is girlfriend to the guy who owns the green truck featured in my previous post. She is mother to three! 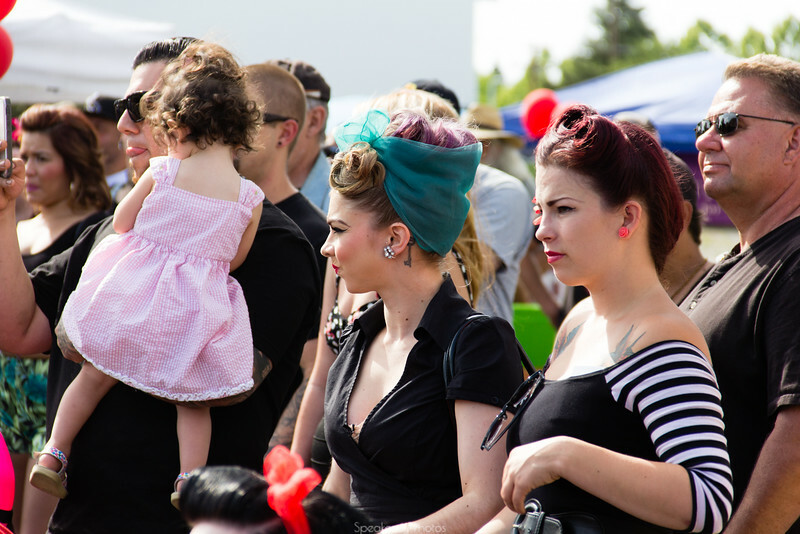 This was her first contest, photo submitted by her Placerville photographer. Their entry was done via email. I sincerely hope to again see these folks. The final three! Elizabeth, the pink dress, took third place. I enjoyed her answers in the first round: something fun about herself? “I like to work on cars!” As a pinup, the must-have item in your purse? “I don’t carry a purse.” I and the crowd loved that! Second place is the Marilyn Monroe enthusiast. First prize to Isela, Elvis enthusiast. We chatted for a bit while waiting for the contest to begin. This was her first contest! She sews, and she went to Viva Las Vegas this year! Shane and I had hoped to go but were not sure about the kids. Isela pointed out the kids present looked miserable so next year we may attend without them, or bring dedicated childcare AKA grandparents. The fifteen minutes or so we spent chatting tell me we could be friends. Here is her proud husband and child.